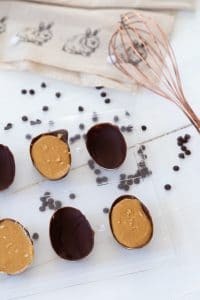 Easy, fun, and yummy dairy-free easy vegan Easter eggs! 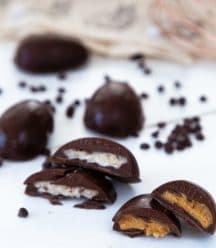 We created a vegan chocolate peanut butter cup egg and a coconut filled egg for you to make for your family and friends! 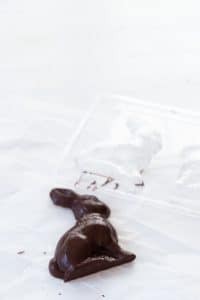 We also show you how to make a solid vegan chocolate Easter bunny. This post contains Amazon affiliate links. Purchases made through these links help support Veganosity.com at no additional cost to you! 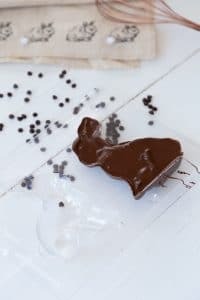 DO YOU WANT TO MAKE EASY VEGAN EASTER CANDY? Finally! It’s been five years since we’ve been able to have peanut butter filled and coconut filled chocolate Easter eggs. We used to devour Reese’s eggs and Almond Joy’s right around Easter, not to mention jointly devouring a giant dairy-free chocolate Easter bunny. Since going vegan, that tradition fell by the wayside. After all, finding vegan versions in stores can be really difficult. Thankfully, this year will be different, because we got our acts together and made our own. Why it took us so long, we’ll never figure out, because this wasn’t just easy, it was so much fun! It seriously took all of 15 minutes to get the first coating of chocolate in the molds, and then another 15 minutes to freeze the chocolate before adding the filling and the final layer of chocolate. Once we did that, we popped them back in the freezer and they were ready in about 20 to 30 minutes. 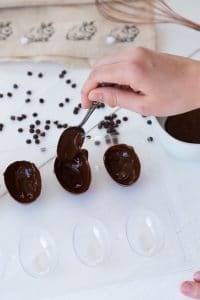 So, let’s get right into this so you can make vegan chocolate filled Easter eggs for your family and friends. The first thing you’ll need to do is purchase the candy molds. We chose to use egg shaped molds and the classic bunny. How adorable are the silicone molds below! 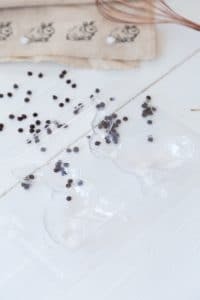 Unfortunately, we didn’t find them until after we photographed the photos for this post, but the simple plastic ones we used worked just fine. 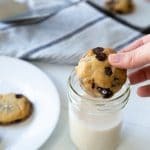 Another thing you’ll need is vegan chocolate chips. 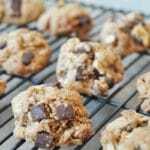 You could spend a lot of time using baker’s chocolate, adding oil,sugar, and other ingredients, but why? This is so much easier. 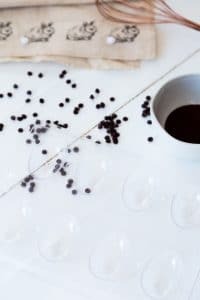 We use Enjoy Life chocolate chips. 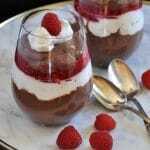 It melts beautifully in the microwave or in a double boiler on the stove. 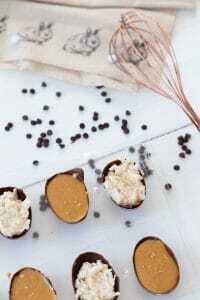 WANT TO SEE HOW WE MADE OUR VEGAN CHOCOLATE PEANUT BUTTER & ALMOND EASTER EGGS? 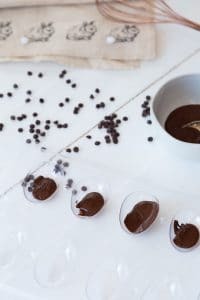 Melt the chocolate until it’s smooth and silky. 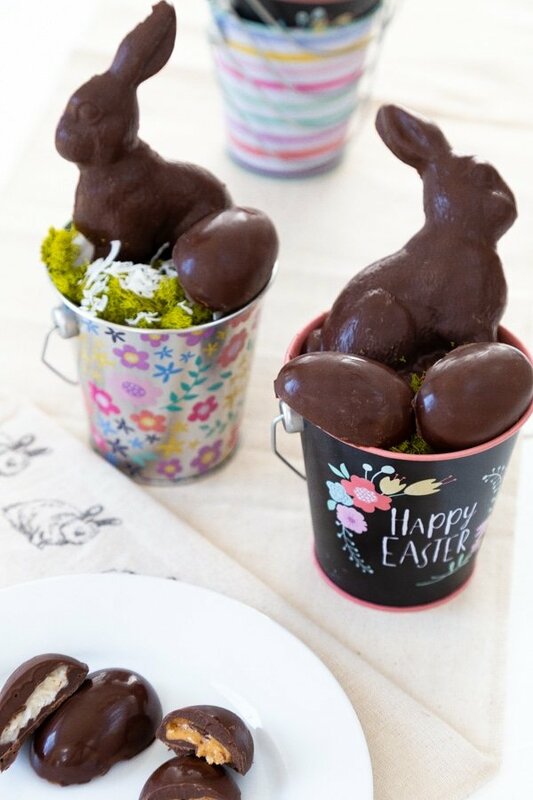 Use a spoon to paint a thin layer of chocolate on each egg mold . You want it to be thick enough to cover, yet not so thick that you won’t have room for the filling and final layer of chocolate. Freeze the chocolate for 15 minutes or until it’s solid. 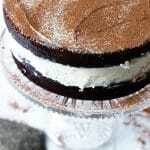 While the chocolate is setting, make the peanut butter and coconut fillings. Fill the center of the eggs with the fillings. We filled half with peanut butter and half with the coconut filling. Cover the filling with chocolate and freeze for about 20 minutes, or until it sets. Pop the eggs out of the molds over parchment paper. Try and get the mold as close to the paper as you can so you don’t chip the chocolate or break the eggs. 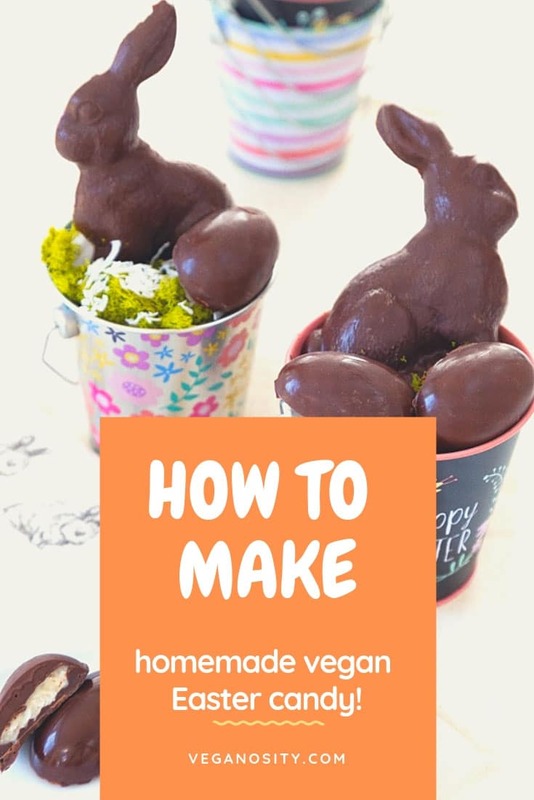 Here you can see our exact process of making our awesome dairy-free and vegan Easter chocolates! WOULD YOU RATHER HAVE SOLID CHOCOLATE? Lucky for you, we’ve also created solid chocolate bunnies! Fun Tip: make giant versions of our peanut butter cups or almond cups by using the same chocolate egg process, but in the rabbit mold. WHAT SHOULD YOU FILL VEGAN CHOCOLATE EASTER EGGS WITH? 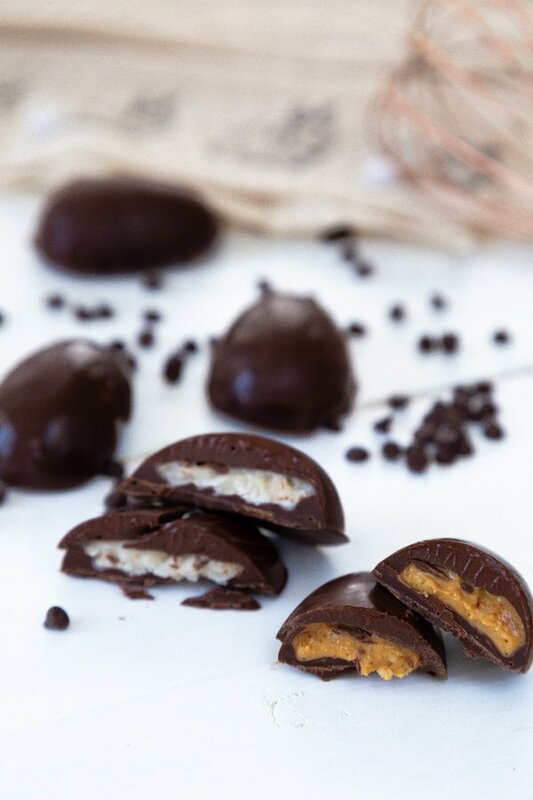 Two of the most popular chocolate Easter candy fillings are peanut butter and coconut. We love both equally, so we made both. Both are easy and both are delicious! Put one cup of peanut butter in a bowl and stir in the powdered sugar until you get the consistency that you desire. If you like a thinner filling, add less sugar, if you like a solid filling, add more. If your powdered sugar is lumpy, use a sifter to make it smooth. Put the coconut, condensed coconut milk, vanilla, and a pinch of salt in a bowl and stir until well combined. WHAT IF YOU DON’T LIKE PEANUT BUTTER OR COCONUT? 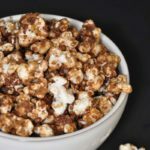 Whether you’re allergic to coconut and peanuts, or just don’t them, there are plenty of alternative fillings to use! 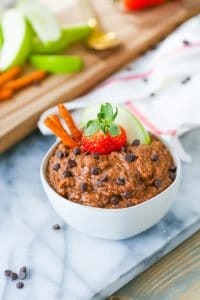 You can also fill the eggs with fruit preserves, our date caramel, our vegan dark chocolate chip cookie dough, our oil-free dark chocolate brownie hummus, or just fill the whole mold with chocolate! 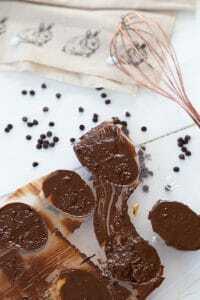 CAN YOU FREEZE HOMEMADE CHOCOLATE CANDY? Yes! 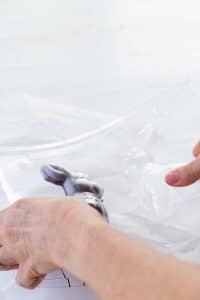 Make sure to wrap it in a freezer safe bag or container and you can freeze it for up to 3 months. Store it in the refrigerator for up to 1 week. 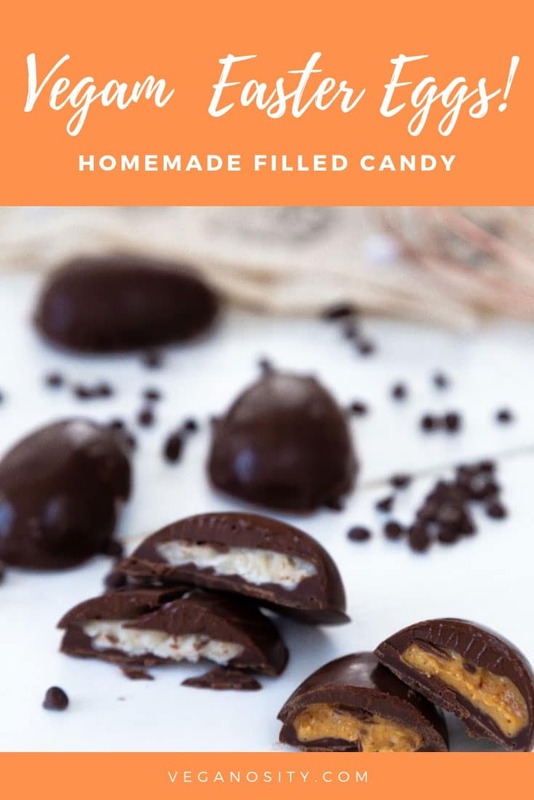 Make our homemade Easter candy and let us know what you think. We love to hear from you! And, don’t forget to take a picture of your gorgeous creation and tag us @veganosity on Instagram. 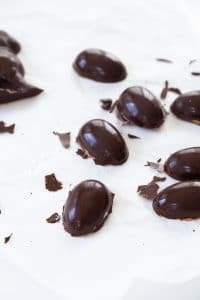 Easy and vegan homemade Easter egg candy. 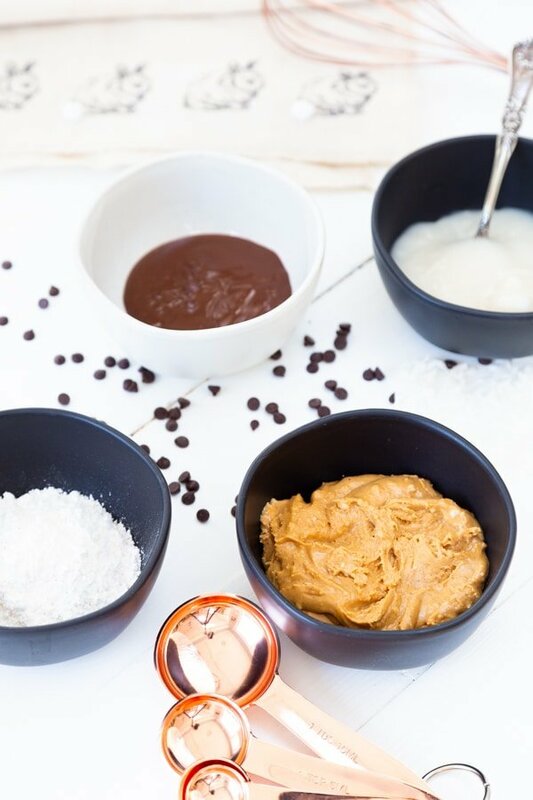 In a small bowl, stir the peanut butter and powdered sugar together until it’s completely combined. In a small bowl, stir the coconut, powdered sugar, vanilla, and condensed milk together until combined. 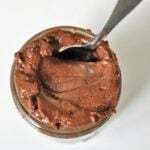 Melt the chocolate in the microwave for approximately 4 to 5 minutes, stirring every minute, until it’s smooth and silky. You can also melt on the stove in a double boiler. Spoon a thin layer of chocolate into the molds so the eggs and/or rabbit are covered. You don’t want it too thin or so thick that you can’t fill them. Freeze for 15 minutes. Take the molds out of the freezer and fill with the fillings. We made half peanut butter and half coconut. 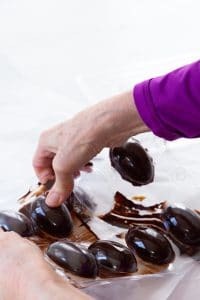 Then cover the filling with the remaining chocolate and freeze for approximately 20 minutes, or until the chocolate is completely set. Gently pop the eggs/rabbit out of the mold over parchment paper. Keep the mold as close to the paper as possible so they don’t have too far to drop. 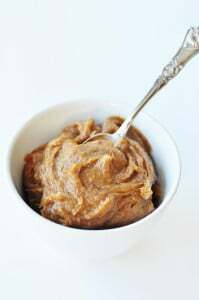 • Add the powdered sugar one tablespoon at a time to the peanut butter until you get the consistency you desire. If the sugar is lumpy, use a sifter to smooth it out. 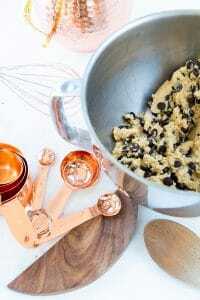 Such fun recipes for Easter, love the options and flavors. Thanks!